The area of a circle is the measurement of the region enclosed by its boundary. It is measured in square units. -ie- square centimetres or square metres etc. The perimeter of a circle is the length of its boundary. The unit measurement of perimeter is the unit of length. where r is the radius of the circle. Perimeter of a circle is known as circumference of a circle. The part of the circle inclined between two radii (OA & OB) is called sector of circle. Where 0 is the measure of arc AB. Any chord AB divides circle into two parts. 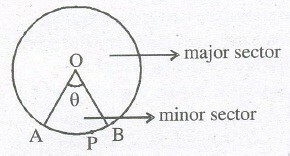 The bigger part is known as major segment and smaller one is called minor segment. 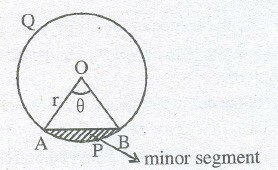 Area of major segment OAQB = πr2 — area of minor segment APB. Area of segment of a circle = Area of the corresponding sector — Area of the corresponding triangle. (i) If two circles touch internally, then the distance between their centres is equal to the difference of their radii. (ii) If two circles touch externally, then the distance between their centres is equal to the sum of their radii. (iii) Distance moved by a rotating wheel in one revolution is equal to the circumference of the wheel.